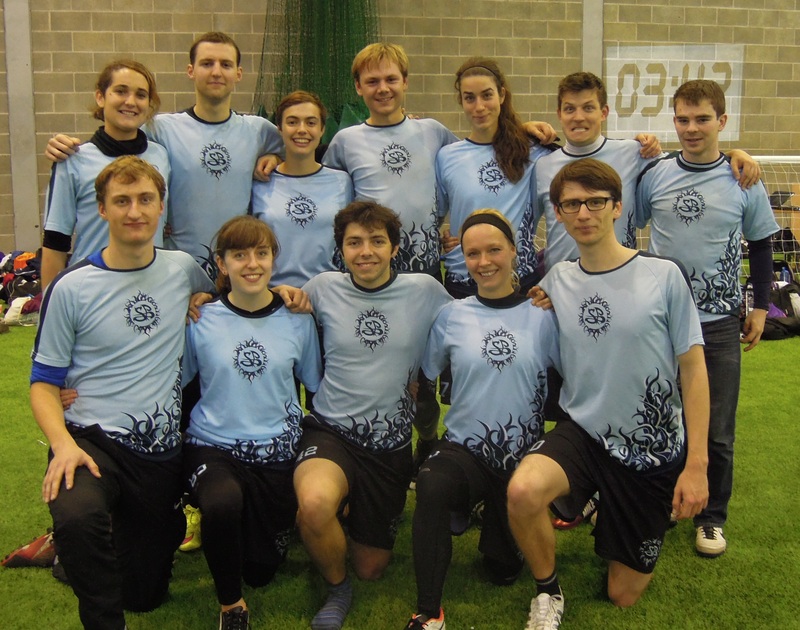 After a successful start to the season winning Indoor Regionals, SB took a team of 11 players (plus 1xJR for the sideline) to Coventry on November 28th/29th to compete at University Mixed Indoor Nationals. The team ended the weekend placed 10th in the country, including universe point losses to the teams who finished the weekend 2nd, 4th and 8th. Top: Helena Andres, George, Anegg, Charlie Daffern (C), Rolo Turnell-Ritson (C), Elsa Matthus, Hayd Reynolds, James Richardson. Bottom: Joe Beeby, Lizzie Pearmain, Danny Hunt, Fran Kundel, Bryn Coldwell. 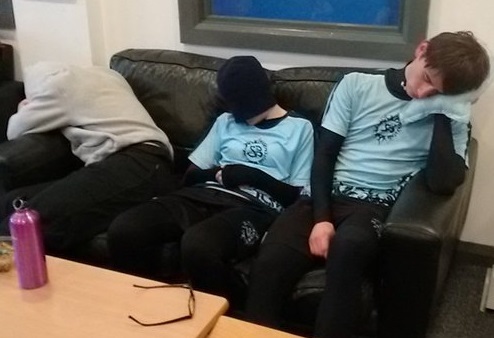 First match on led to unfortunately early starts on the Saturday morning with George, Rolo and Bryn suffering through a 05:45 train out of Cambridge (shout out to Eleanor for driving the discmansion boys to the station at such an antisocial hour). The rest of us left Cambridge by car slightly later, the only a minor hiccup being when Joe accidentally knocked on the wrong door at 06:45 in the morning… We all made it to the venue alive, despite mixed reports of Hayd’s driving. The first game of the weekend started off slow, with both teams trying to find their feet. We were playing the 3-2 offense we stuck with throughout the weekend, combined with simple man defence. Points were traded initially until the SB offense really switched on, successfully capitalising on a few errors from Hallam to pull away a comfortable win in a good start to the weekend. Scheduling left us with a 2h40m break between games at this point, so we went through to the café and gradually colonised the sofas. Food was eaten, naps were had, more food was eaten, more naps were had. It was a really long break. George almost certainly did some foam rolling. With SB Women having lost to Chichester at EUWIR the previous weekend, we came into this match with something to prove. Their women were strong, with one particular handler throwing breaks for days, but the ladies pulled through on defence to shut down their options whilst the guys did the same. I think we were really able to use the long-shots in the game perhaps more than in the previous two, with Rolo’s hammers coming through strong. A few games off and we came into the last pool game, against the #1 seed from Scotland. This team was solid throughout, with standout tall guy, and we had to really step up our game to match up to them on defence. The SB offence was feeling good, with options coming through strong despite tough man-D from Glasgow. Sadly the story was similar to UCLan; a slight dip from SB in the early- to mid-game allowed Glasgow to take a break or two and go up on us. Bryn helped to pull the game back with a fumble-to-behind-the-back-catch save (nobody looked more surprised than him that it worked out). A heroic effort towards the end allowed us to earn ourselves a comeback universe point opportunity in which we were going out on defence. 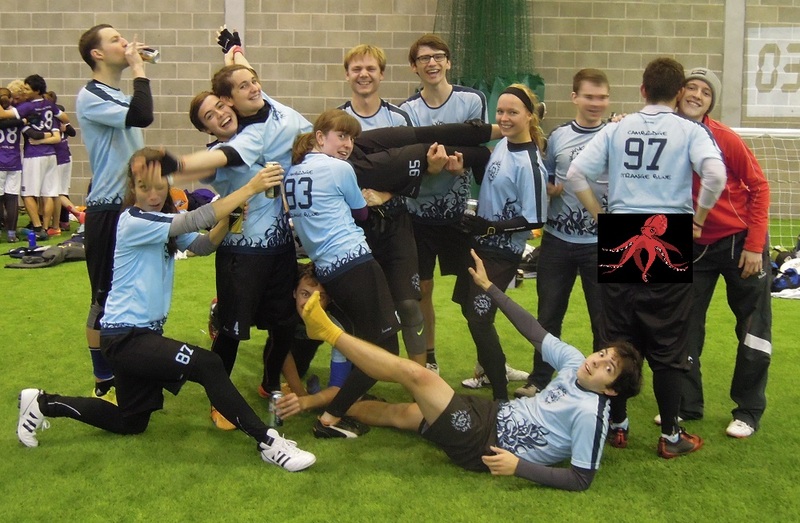 Despite earning a turnover from them we weren’t able to hold onto the disc, and once they were back on offence Glasgow were able to take the win with some clean execution. Fun game – despite the Loughborough ladies being rapid and making some amazing bids on defence, the SB team held their own to pull through the win. Whilst Hayd, Helena, Fran, Bryn and George headed home overnight the rest of us stayed in the Coventry scout hut organised by the TD. After setting up camp we managed to make it to the pub for dinner in the nick of time, arriving at 20:56 for a 21:00 food order deadline. Close call; good job Lizzie for organising us all to get there. Back at the scout hut Rolo was giving out after-dinner remedial massages (a.k.a. mainly just laughing whilst causing Danny pain). A surprise Clackers appeared. Mother Octopus was praised. Everybody made it back to the venue bright and early, if not 100% awake. It was Helena’s birthday, so we gave her the card we’d been surreptitiously handing around to be signed the previous day. We warmed up and woke up. The Dundee offense in this game was typified by scoobers to tall receivers, something we never quite managed to shut down due to the precision and consistency with which they were able to execute, although George did make some cracking blocks. Whenever we did threaten the iso play Dundee showed their class with some chilly dump/swing offence and were always ready to attack upfield. It was hard work but fun to play against. Our offense was generally doing good things against Dundee’s defence, with handlers working the disc well until up-field cutters got free. Same story as the previous two losses though: the SB consistency declined slightly early on in the game, allowing Dundee to pull ahead a lead which we never quite made up. Again, we were on D for universe point, and weren’t able to turn the smooth Dundee offence. Despite having already beaten this team the previous day we knew it had been a close game the first time round so went in hard. In the end this match was very similar to the first, with a close scoreline and good play from both sides. Also, Hayd got a layout callahan. We accidentally threw two callahans – they were not our finest moments. Other than that this was an incredibly competitive game. Both teams were able to earn turns through tough defence, and both were able to work the disc well through handlers, under cuts and longer options. In the end though Leeds were able to make fewer mistakes and apply more pressure on defence, taking the game on universe point after a final seconds turnover from SB followed by a wicked IO backhand break into the endzone from the Leeds offense. In reality we probably slightly underachieved as a team, and it was super disappointing to lose three games on universe point, obviously. We had a particularly tough time with our crossover into the top 8 coming vs. Dundee, who went on to finish second in the tournament. At the end of the day though that’s the way the cookie crumbles, and was a position we found ourselves in due to our record in the group stage. Despite moments of greatness in which we competed on the level of some of the top teams there we couldn’t quite keep up the consistency on offence and defence that we would’ve needed to compete right at the top of the tournament. Nonetheless this was an incredibly fun weekend, which Fran summarised perfectly in our end of tournament huddle. What we had for this tournament was a great group of people – it was the team which made this tournament one of the most fun I’ve been to in ages, so cheers guys. The tournament ended with a beautiful rendition of ‘Happy Birthday’ for Helena, who proceeded to entertain us with her considerable fruit juggling skills. Congratulations to George for winning MVP!